The 13th Meeting of the Conference of the Parties to the Convention on Biological Diversity (CBD COP13) brings together 10,000 representatives of governments, international organizations and stakeholders in Cancun, Mexico, to advance the implementation of the Strategic Plan for Biodiversity 2011-2020 and the Aichi Biodiversity Targets. The knowledge and practices of Indigenous peoples and local communities (IPLCs) are key to safeguarding our planet’s species while achieving the Sustainable Development Goals. 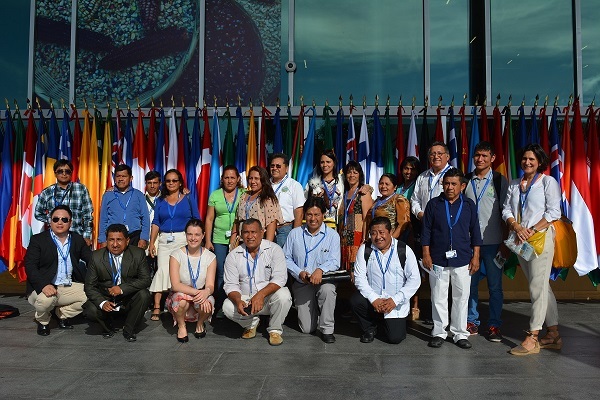 The Equator Initiative, the GEF-Small Grants Programme (SGP), the CBD Secretariat, and partners, host a six-day program of work at COP13 to discuss and share best practices of IPLCs, and develop capacities of Equator Prize winners and SGP grantees. The "Muuch'tambal Summit", promoted by the Government of Mexico and the CBD, highlights the experiences of IPLCs and their contributions of traditional knowledge and cultural diversity to the conservation and sustainable use of biodiversity. The preparatory workshop for Equator Prize winners /SGP grantees attending COP13 was meant to be a recap session focused on the content shared through the online course, a preparatory session prior to the Article 8J negotiations on 7 December, and served as a capacity building session to ensure all Equator Prize winners/ SGP grantees are ready to present on their work on 8 December, at the Rio Conventions Pavilion. 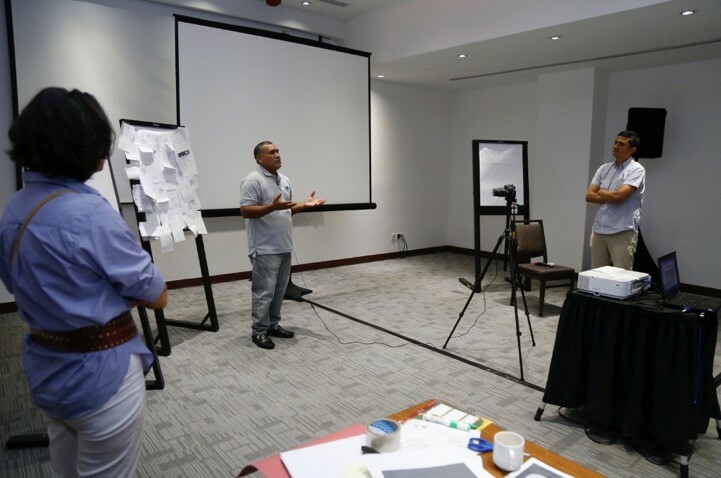 The workshop was also an opportunity to prepare material for the 15-year celebration of the Equator Initiative and the 25-year celebration of the GEF-Small Grants Programme. Representatives of 18 Equator Prize winning communities/ SGP grantees were invited to follow the CBD COP13 negotiations on Article 8J focused on promoting national legislations that respect, preserve, and maintain innovations and practices of indigenous and local communities embodying traditional lifestyles relevant for the conservation and sustainable use of biological diversity; that promote their wider application with the approval and involvement of the holders of such knowledge, innovations and practices; and that encourage the equitable sharing of the benefits arising from the utilization of such knowledge, innovations and practices. The day concluded with a recap session over a work dinner with all Equator Prize winners/ SGP grantees to analyze Article 8J negotiations and their impacts on the Equator Prize winners/ SGP grantees’ work. 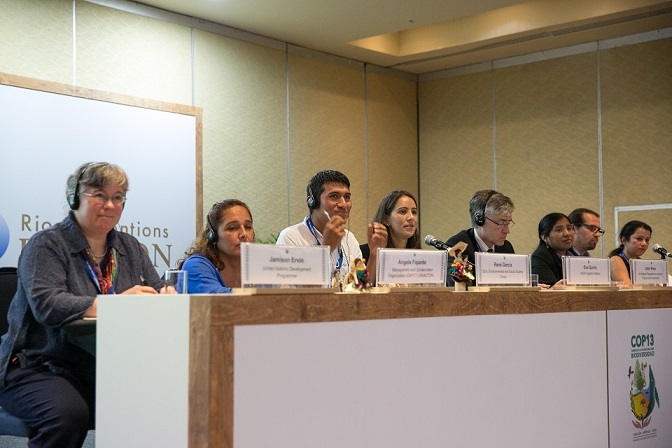 Equator Initiative, GEF- SGP and partners, hosted the “Indigenous Peoples and Local Communities (IPLCs) Day” at the Rio Conventions Pavilion. The intention of the day is to provide a platform to showcase indigenous and local community voices and perspectives, and to serve as an effective bridge connecting policy makers, academics, private sector, civil society and the media with on-the-ground practitioners. Organized by Equator Initiative, GEF- Small Grants Programme and partners, the day consisted of a series of dialogues and panel discussions (5 in total, followed by a reception), to share knowledge, exchange best practices, inform policy, and enhance capacity. Topics addressed mirrored the main themes of COP 13 and SDGs, while focusing on local solutions for the protection and sustainable use of biological resources. The reception was the first event in a series of celebrations to mark the 15th anniversary of the Equator Initiative and the 25th anniversary of the GEF-Small Grants Programme. 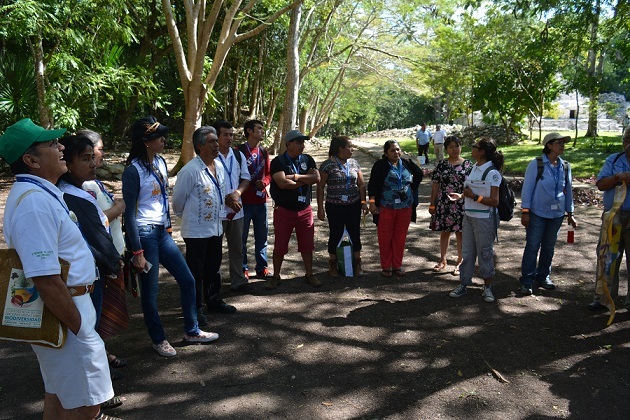 Hosted by the Mexican government, the visit aimed to provide IPLCS attending COP13 with an opportunity to interact and exchange ideas and experiences with an indigenous community on the thematic topics of agriculture, fisheries, forestry and tourism. Hosted by the Mexican government and the CBD, the aim of the Summit “Muuchtanbal”, was to present and share experiences from indigenous peoples and local communities, Parties, International Organizations, on the contributions of traditional knowledge, and the cultural diversity across sectors including agriculture, fisheries, forestry and tourism, for the conservation and sustainable use of biodiversity. The Summit concluded with a regional cultural presentation and celebration of the 20th Anniversary of the International Indigenous Forum on Biodiversity (IIFB). 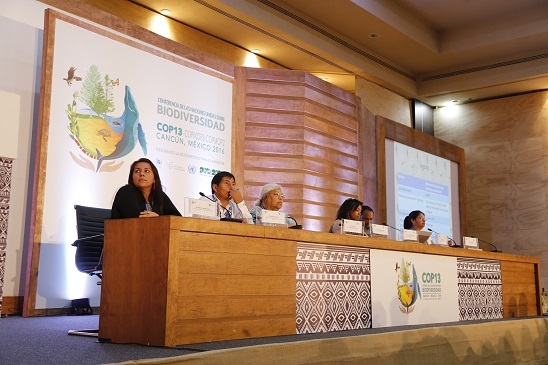 Conclusions were presented at the plenary of COP13.